The DarkStar UAV was developed for DARPA's "Tier III-" requirement for a LO-HAE (Low-Observable High-Altitude Endurance) UAV. "Tier III-" itself was a downgraded variant of the "Tier III" specification, which called for a larger and more complex vehicle. "Tier III" was abandoned because of too many technological and financial risks. The ACTD (Advanced Concept Technology Demonstration) contract for the "Tier III-" UAV was awarded to Lockheed Martin in June 1994. A major subcontractor with a 50% share was Boeing, which was responsible for wing development and production. The first flight was originally intended to occur in October 1995, but was delayed by software problems until March 1996. However, the program was stopped again after the first prototype crashed on take-off for its second flight in April that year because of a control system malfunction leading to pitch-up and stall. In January 1997, the DarkStar was officially designated RQ-3A, and in June 1998, flight testing finally resumed with the second RQ-3A vehicle. The RQ-3A was a LO flying-wing design with a very slightly forward-swept wing and a "flying saucer"-shaped fuselage section. It was powered by a single Williams F129 (Model FJ44-1A) turbofan engine, and could cruise for about 12 hours at an altitude of up to 19800 m (65000 ft). For the planned fully autonomous missions, the DarkStar was equipped with a GPS/INS navigation system, which could be retasked in flight. Communication was done via two-way datalinks (command and control uplink, sensor data downlink), either a wideband line-of-sight link or a J-band SATCOM link. The payload bays in the lower fuselage could accommodate various types of sensors, but the primary options were a Northrop Grumman AN/ZPQ-1 TESAR (Tactical Endurance Synthetic Aperture Radar) surveillance radar or a Recon/Optical CA-236 electro-optical camera system. The problems and delays of DarkStar lead to rising costs, and in January 1999 the USAF decided that the advantages of the RQ-3A over the less ambitious RQ-4 Global Hawk were not sufficient to warrant completion of the development program. 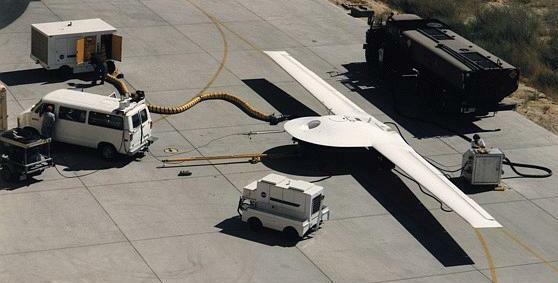 At least officially, the program was cancelled and the two DarkStar ACTD vehicles remained the only RQ-3As built. However, it appears that this was not quite the end of the story, because during Operation Iraqi Freedom in March/April 2003, the USAF acknowledged the operational use of at least one prototype of a new stealthy high-endurance UAV. Other than being a scaled-up and more capable derivative of the DarkStar, nothing was revealed about this UAV.